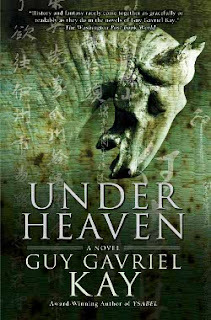 Guy Gavriel Kay's newest book, Under Heaven, is a fantasy novel set in an alternate 8th century China (called Kitai). Tai is a young man who has just completed the required two years of mourning for his illustrious army general father. Tai pays his respects by venturing to a far-off battlefield where tens of thousands of Kitan soldiers died while fighting the Tagurans. He spends his two years burying these soldiers (from both sides) properly so that they can be at rest. This earns him the gratitude of both the Kitan Emperor and the former Taguran enemies. So much so that that the Taguran queen offers him 250 Sardian horses- the best horses ever and extremely valuable, particularly in a charged political climate- in gratitude for his service. This gift is a curse as well, though, as it forces Tai to become an important player in a political game that is often over his head. He must travel to Kitan's capital, Xinan, to determine what to do with his gift. But all is not well there. The aging emperor has cast aside his wife for a very young, beautiful concubine. The first minister and the most favored general despise each other and could cripple the whole empire. And Tai's sister, Li-Mei, has been sent as an imperial bride to the nomads by their politically connected ambitious older brother. Tai must find a way to stay alive and do what he thinks is right in a world that is increasingly complex and full of gray areas. I was so excited to be offered an ARC of this book to read and review here because I really love some of Guy Gavriel Kay's books. I am a huge fan of both The Lions of Al-Rassan and A Song for Arbonne. Kay is an author, though, who sometimes seems to write to formula. For example, multiple books have prologues that end in the same way. He has a very annoying "pairing up" habit in which he'll put two characters left single at the end of the book together, regardless of whether the personalities match. He is also very, very wordy. He will never say with three words what he could say with ten. Preferably involving as many commas as possible. He likes to say things like, "It was, he thought, unfair." "She was, he realized, looking at him." "This required, he decided, some thought." Regardless of that, I still love those two books and I was excited to get this one. It says a lot, right, that his writing style often annoys me but I like his books so much, anyway? There is no prologue in Under Heaven and he seems to have tamed his "pairing up" thing, which is much appreciated. He still does the unnecessary-phrase-set-off-by-commas thing. And he is still long-winded. Instead of just saying, "The emperor entered the room. Tai bowed," he will say, "The emperor entered the room. Tai bowed. There was nothing else for a man to do but bow when the Imperial ruler of the civilized world, who had killed two brothers and a cousin to get to that position, who had stolen his son's wife to be his own concubine, and who now wanted to meet Tai, entered the room on a jade throne worth more than Tai's 250 Sardian horses." So I guess it is clear that parts of this book really irked me. More stylistically than anything else. For example, all the female POVs in the story were told in the present tense, but all the male POVs were told in the past tense. Why?! What does that accomplish? It was very hard for me to get involved in this story until about halfway through, when Tai finally made it back to the capital, Xinan, and we met the more subtle and interesting characters. After that, though, I was really into it. The action finally picked up and the political machinations became more complex. And I finally started liking some of the characters and caring what happened to them. I read the second half of the book in a much more engaged way than I read the first half. And while this is not my favorite Guy Gavriel Kay novel, I felt satisfied with the story at the end. I am really happy that the East is showing up more in fantasy fiction. I think Kay did really well in presenting ancient China and he made me want to look more into the machinations of the 8th century and just learn more about life in Imperial China, generally. It was a very rigid and traditional system and I think it would be fascinating to know more about it. The fantasy element in this story is very light; there is little magic. Kay's writing takes place on a different world, but he focuses much more on people and the effect that individuals have on events and history. In that way, they're fascinating. Kay makes a point of showing how people can be skewed positively or negatively by historians and poets. And how some people who are so vital to the outcome of events can become so obscure in history. There is also a lot of poetry in this book. I am no judge of poetry- I was not over or underwhelmed by the poems presented. So overall, I enjoyed this book, though it took me well over 250 pages to feel really engaged with the story. If you are willing to make that investment, then I think you'll be pleased by the end result. But if you must only read one Guy Gavriel Kay book, then I still whole-heartedly recommend The Lions Of Al-Rassan above all other books. Edited to fix many small errors- sorry! But yes why that sort of POV, hm. But I am going to try The Lions of Al-Rassan! I like Kay's name and am determined to like his writing. This looks like something worth checking out! The wordiness gets to me too though and that annoys me real hard! GGK is one of my ATF (All-Time-Favourite) authors. A Song for Arbonne is one of my favourites as well, but I also really enjoyed Tigana, the Fionavar Tapestry (which is where I started into his books), and Ysabel, which I just read last year. I'm not surprised to hear there is poetry in this upcoming work -- he is an accomplished poet -- and it sounds like there's a lot of other reasons to anticipate this novel as well. Thanks for the taste! Blodeuedd- I have no idea! The publicist wrote and told me she interpreted it as reflecting the immediacy and caution that females at the time needed to exert. I don't know if I agree with that, but I am sure there is *some* reason he did it! Jenny- I have never read Orson Scott Card. I wonder if I would notice that about them. I am going to reread Lions of Al-Rassan for the flashback challenge this year, so I suppose I'll find out there if his writing was always like that or became so more recently! Aths- Same. Though maybe I'm not one to talk since my reviews are so long! Buried in Print- I really like him, too. I know most people really love Tigana, but that's just not one of my favorites (the pairing up habit is in full force there). I definitely think there is a lot for the GGK fan to anticipate! I don't think I will be picking this one up. I give up way before 250 pages. I don't read many fantasy novels (last one The Magicians; Grossman). This one probably would not be for me? I've only read one GGK, Ysabel which was rather enjoyable. I may have to pick up all of his books someday. Fine review, Aarti. I think the East is really cool, and love reading about fantasy which incorporates it (Across The Nightingale Floor by Lian Hearn is one) so will totally check this out once I've reduced the TBR a bit. I have an author crush on GGK - Lions is one of my favorites of all time. I have actually stopped reading his novels, because I'm afraid I will run out - what will I do when I don't have another GGK novel to read? (Yep, I'm a dork.) I will, of course, read this. Your review of this book made me smile and giggle. I love that you loved this book despite the author's wordiness. Some of my favorite authors tend to get wordy sometimes as well. When the story is good enough, I can gloss over it and get on with my reading while smiling at the absurdity. I have The Lions of Al-Rassan on my wish list, and probably will be buying a copy for my birthday this month. I have heard you say so many good things about it that I fear I am definitely missing something by not reading it! I might take a look at this one when it comes out as well because I love to read about Ancient China and think that the synopsis you provided was really interesting. Awesome review, your love for this author really shines through! Chinese fantasy yay! I think it's really great to see more of it, if anyone has the mythology and the drammatic early history for a great fantasy setting it's the Chinese. I'm interested and sometimes stylistic stuff does bug people about the books you really like for other reasons, but if you don't throw the book at the wall it probably means they're not a barrier to enjoyment (even if they are still an annoyance). I find it fascinating that you would complain about a very specific aspect of the writing, and even go so far as to offer an example - that you completely made up. Why would you not choose an actual quote from the book to illustrate your point? Paul- an actual quote would be pretty long. I did mention that he is verbose. A general overview gets the point across. Are you trying to tell me you couldn't lift a sentence from the book that illustrated your point that wasn't significantly longer than the 64 word behemoth you put into the author's mouth? I confess, I'm skeptical. Yes, my point was that one sentence COULD have covered the subject but was not used. That is what I said above. Your skepticism does not bother me. I am obviously at a disadvantage in responding to this review, as I have not had the pleasure of reading Mr. Kay's most recent book. I have however read all of his other books, including his fine book of poetry. It is Guy Kay's ”wordiness” that makes him not one of my favorite authors, but my favorite. If you were to take away all of those comma rich sentences, you would be left with so much less, not just fewer words, but a far less vivid world. (my extensive use of commas is intended.) I have never understood this criticism of Mr. Kay's work (I have heard it before). It sounds to me like; 'Please write less descriptively, more simply, and with no feeling for the poetic.' I am imagining this same idea applied to Shakespeare. How would people react to a review of Hamlet that wished for shorter sentences, and less linguistic interest. All this said, I hold out for the possibility that after I read the book I will agree with your assertions. John- I do not mind long sentences, I mind the use of two words set off by a comma. Why not say "He thought it was excessive"? Instead of, "It was, he thought, excessive"? I don't personally think that fewer commas leads to a less vivid world. I didn't notice this tendency in Kay's earlier works (many of which I like). It only started standing out to me in Last Light of the Sun and I suppose now that I've noticed it, I can't ignore it. I would personally appreciate a more varied sentence structure. As to the poetic value, you are probably right. As I say in the review, I don't read much poetry so I can't judge the poems included in this book. And maybe because of that, I don't appreciate the commas and the pauses they bring into the story. You are correct that no correlation exists between commas and the vividness of the writing. I do think that often a compound sentence adds complexity and that complexity can add to the vividness of writing. The “He thought it was excessive,” example is an interesting one. The two sample sentences may relate two different ideas. If I was writing a story and used the sentence: “He thought it was excessive”, my character would truly believe that something was excessive. If I used the structure “It was, he thought, excessive” I might be implying doubt or by setting 'he thought” as a separate clause I might be implying that he was alone in his thought. I do agree that a verity of sentence structure is always a good thing. I also believe that Mr Kay like all authors may fall into habits. The over use of a particular sentence format being one. I would be willing to bet, however, that if Mr. Kay uses ten words were he could have used three, he had a very purposeful reason for doing so. I'm never entirely sure what Kay's trying to do with his past/present tense shifts. He doesn't seem to stick to the same rules from book to book, or even within the same books. It always throws me, because I tend to think that there needs to be a concrete reason for this sort of thing. I'm looking forward to this book, but I'm not sure I'll be buying it in hardcover. Maybe if Kay rolls through town before I leave for New Zealand. Otherwise, I'll probably borrow it from the library or wait for the paperback. He's one of my very favourite authors, but I didn't find his last two books as engaging as some of his earlier work. Hearing that it took you so long to connect with this one makes me think it'll be in the same vein as THE LAST LIGHT OF THE SUN and YSABEL. GGK is my favorite author, and his magnificent use of language is one of the reasons why. I often joke that he has ruined me for other authors. Only Patrick Rothfuss has come close to the sheer pleasure I get from GGK's writing style. While 'He thought it was excessive' and 'It was, he thought, excessive' say the same thing, the, for lack of a better word, texture of the sentence is completely different. The pauses wrought by the commas lend a wonderful weight and sense of importance to the sentence that would be diminished without them, to me at least. John- I apologize for not responding to your comment before. I must have forgotten about it somehow! You are right- I would assume that there is a reason for using a particular sentence structure. However, I personally feel that Kay uses this same sentence structure, with the clause offset by commas, an excessive amount. I am also a bit of a comma psycho, though. I think MOST people overuse commas and it bothers me. I feel that if he wanted to say "It was, he thought, excessive" to convey a particular feeling separate from that of "He thought it was excessive" or even just "It was excessive" then he could have used it more sparingly. He used it everywhere, though. Memory- Sorry to you, too, about the delay in responding! I feel a lot of authors shift tenses for literary purposes that are above my head. I'm not a big fan of them, either. I never read Ysabel, I admit. The storyline didn't really call out to me. But I was also disappointed in Last Light of the Sun. That book annoyed me with all the ellipses! Brian- The Patrick Rothfuss/GGK comparison is a good one! I explained in detail my response to the comma thing in response to John above. Again, I'd just say that to me, not *every* sentence needs "weight and sense of importance." I think varying the sentence structure a little would lend *more* weight to the sentences that need that power rather than giving every sentence the same structure.